I’ve been cutting Greg’s hair for years. For those of you familiar with hair clippers, I use the one guard all over. No problem. Easy enough. Until the one guard decides it doesn’t want to stay on the clippers. Yep, it fell off while I was cutting, and I didn’t notice … until one section across the top of Greg’s head was shorter [much shorter] than the rest. I didn’t panic. I just put the one guard back on, thinking maybe I could smooth it all out later and nobody would notice. Then it fell off again. I noticed quicker the second time, but I had already cut a smaller section on the side of his head. No smoothing it out at this point, especially because the one guard fell off a third time. I ended up just cutting all of his head with no guard. Yeah, that’s short. 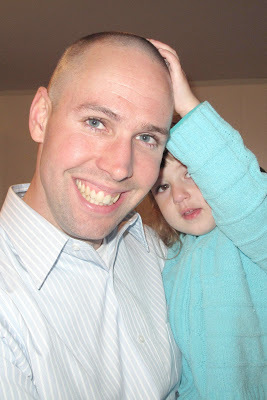 I told him it was a military haircut in honor of Veteran’s Day. Thankfully, he was a good sport, but I still felt terrible. At least we both laughed about it. So she did. I told her I cut his hair a little too short. Obviously. Greg asked me to put new hair clippers on the Wal-Mart list. [I do appreciate that he blames the clippers and not the barber.] I did, but I told him there was no hurry to buy new clippers because it’s going to be quite some time before he needs another haircut. Haha! For a mistake, it doesn't look bad!